It’s a question that both parents and students have wondered for years: why don’t school buses have seat belts? With all of the safety regulations in place regarding children in cars, it doesn’t make sense that school buses, which carry millions of children to school each day, don’t come equipped with seat belts. Fortunately, that may soon change. 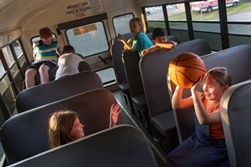 Mark Rosekind, administrator of the National Highway Traffic Safety Administration (NHTSA) has announced for the first time that his agency supports having all school buses in the United States fitted with seat belts. Officials believe that by doing so, the number of child deaths related to school bus accidents, which according to NHTSA stands at four annually, will be cut in half. Currently, only six U.S. states have regulations that require safety belts in school buses. Officials hope that NHTSA’s endorsement is enough to encourage states to voluntarily install seatbelts in their school buses. If this safety measure has to go through the regulation-making process, NHTSA fears it could be a decade before every bus in the country has safety belts. Cost is also a concern, as seatbelt installation is quite expensive. The cost to equip just one bus ranges between $7,000 and $10,000. With nearly half a million school buses in the United States, the total cost could reach into the billions. Most parents would agree, however, that child safety is priceless. If your child was injured on or around a school bus because of the negligence of someone else, you likely have lots of questions, and we have the answers. The Steinberg Injury Lawyers have helped many accident victims in Los Angeles get the financial compensation they deserve that can help cover the costs of medical bills, vehicle repairs, and even time lost from work. Schedule your case evaluation with an experienced legal professional by calling 800-989-6385 to find out what our team can do for you.